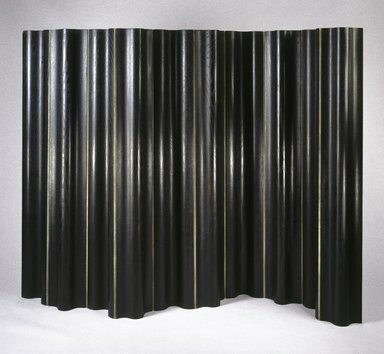 Artist:Charles EamesRay Eames (Bernice Alexandra Kaiser)Molded Plywood Division, Eames Products CompanyHerman Miller, Inc.
Folding screen of black-stained, molded plywood and canvas. Ten panel screen of identical u-shaped panels held together by full-length natural-colored canvas strips that serve as hinges allowing the piece to be accordion-folded to the width of a single panel. Condition: good.